Hailing from Washington, D.C., Aaron D. Spears is a self-proclaimed sports enthusiast who parlayed his confidence and tenacity into a career in television and film, according to his IMDB profile. He has had guest spots on TV shows such as CRIMINAL MINDS, CROSSING JORDAN, THE X FILES, EVERYBODY LOVES RAYMOND and ANGEL. He’s also been in many feature films. 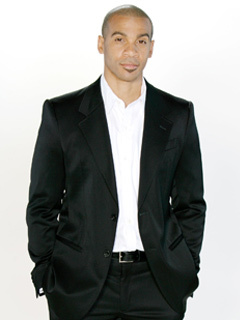 Spears played minor parts on GENERAL HOSPITAL and SUNSET BEACH, but in 2009, Spears took his first leading daytime role on BOLD AND BEAUTIFUL as Justin Barber, Donna’s high school sweetheart and Marcus’s long lost father. Not only is Aaron a full-time actor, but he is a full-time father as well. He and his wife Estela have five children (four of whom are girls). Founded his own company in 1997, called Henna, which puts the spotlight on spoken-word poetry and thought provoking film. His kids names all have special meaning: Nayali Lavender Lopez-Spears (daughter) means gentle love; Aiyana Ari Lopez-Spears (daughter); Henna Heruset Lopez-Spears (daughter) means spiritual good tidings, prosperity and harmony; Kaaria Ziat Lopez-Spears (daughter) means speaks softly but with wisdom; Riaz Novum Nehez Lopez-Spears (son, born Sept 2009) means awakened leader of power. In 2001, he composed the soundtrack for the movie Blue Hill Avenue. A year later, he composed a single called "Makin' Baby." In 2007 he was the executive producer and composer of the movie The Mannsfield 12, which he also starred in. Is It Hard To Kiss An Actor/Actress You Don't Like?